One approach is from near the Glenmacnass Waterfall on the military road (R115). 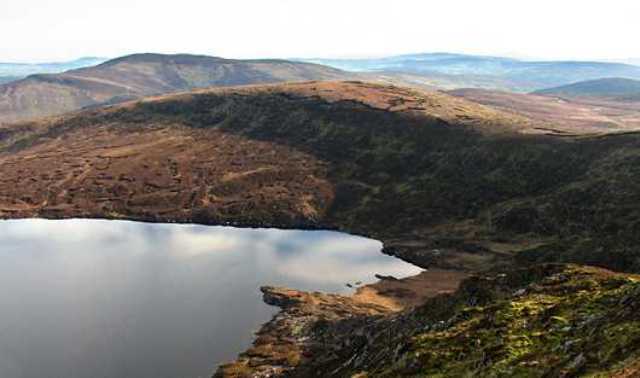 There is a car parking area at O1140003000 A with room for several cars, but be warned that car break-ins are becoming increasingly common in the parking areas of the Dublin /Wicklow mountains. Cross the river and head SW up the spur leading to Tonelagee NE Top. This is a relatively gentle 2.3km slope to the summit. The top is a large flat area with no clearly defined summit and a number of large peat hags. Another approach is from the Wicklow Gap O0752 0017 B from which it is a simple though stern climb first to Tonelagee before making your way to the NE Top.